Emily Weinman, 20, of Philadelphia, appears on 'Good Morning America' to discuss her being arrested on the Wildwood beach in an incident that was captured in a viral video. The Philadelphia woman whose arrest on the Wildwood beach went viral and sparked controversy is speaking out following an announcement from prosecutors that the officers involved won't be charged. 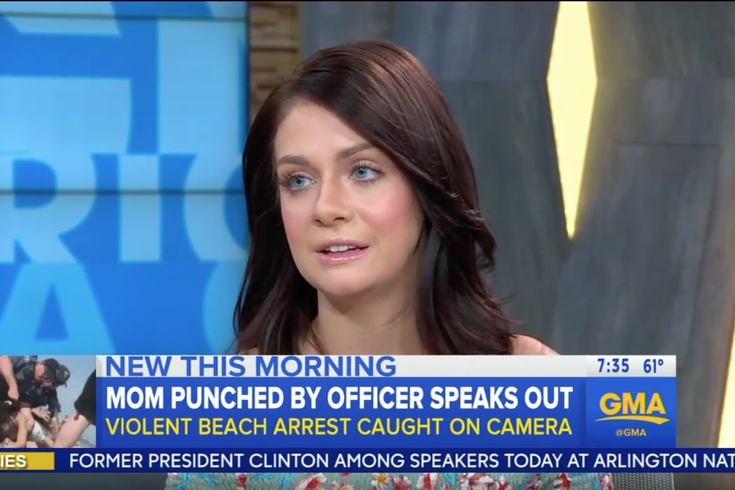 Emily Weinman, 20, appeared on "Good Morning America" on Wednesday to talk about the incident that was caught on video and showed her being punched in the head by one officer. In police body camera footage of the May 26 incident, Weinman and another individual are approached by the officers for allegedly having alcohol on the beach. Weinman passes a breathalyzer test and explains that the alcohol belongs to her aunt, who wasn't with her on the beach at the time. But Weinman refused to give the officer her name. When GMA's Amy Robach asked Weinman why she did that, Weinman explained on the show that she "didn't really see the point in it." "Something in my gut was telling me, something wasn't right, you know?" Weinman said. "I just knew in my rights that I didn't have to give them my name." In the body cam footage, one of the officers says he's going to arrest her after she refuses to give her name. Weinman walks away, which is when the officer says, "Alright, you're going to get dropped." She appears to push the officer near where his body camera is attached to his uniform. Weinman is then taken to the ground and one of the officers throws punches toward her head. "With the spitting thing, when he smashed my head into the ground, I got sand in my mouth. So when they got me to the point where they got me on my stomach, after I was done struggling, trying to defend myself, I spit the sand from my mouth, which makes me look like I'm spitting at the officer. But that definitely wasn't the case and it wasn't my intention at all." Weinman is charged with two counts aggravated assault on a police officer, aggravated assault by spitting bodily fluids at/on a police officer, disorderly conduct, resisting arrest, obstruction and minor in possession of alcohol. Weinman's attorney, Stephen Dicht, said that the more serious charges were filed after the bystander video was released. "I've been real anxious over it. Kind of upset, just, the negative things people say about me. You know, they see one video, one situation, and they're like saying all this negative stuff about a person. But, one situation doesn't define someone. I'm not a bad person. I'm not this person that they're out here trying to make me seem like." Weinman, lives in Philadelphia's Kensington neighborhood, and is a mother. Her young daughter was present during her arrest. Dicht said Weinman wasn't looking for trouble and was just trying to enjoy the day with her child. He also rejected comments made by Wildwood Mayor Ernie Troiano Jr., who defended the officers' actions and claimed Weinman attacked police. It still isn't clear if Weinman plans to file a lawsuit against the Wildwood police. You can watch the entire GMA segment below.